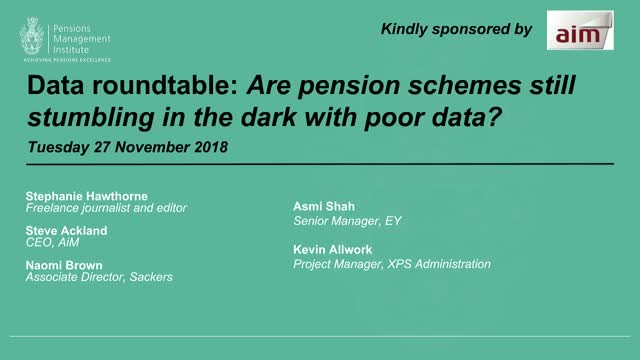 Are pension schemes still stumbling in the dark with poor data? - What are the benefits of good data? - Is GDPR working well? - Will schemes' data be ready for the Pensions Dashboard? - How does poor data impact on scheme funding? - Can you get a better buyin / buyout deal with good data? Steve Ackland, CEO at AIM, discusses the main challenges facing member data in 2019, if pension schemes are ready to participate in the launch of the 2019 dashboard, what trustees need to do to be ready and how to reduce exposure to pension scams. Tim Middleton, Technical Consultant, PMI, discusses PMI's involvement with pension trusteeship, why the professional trustee standards working group was established, when it will be announced and what services PMI can provide for lay trustees. Adrian Campbell, Trustee Representative, Dalriada Trustees, discusses how trustees can plan ahead of Brexit, the conversations Trustees should be having with their sponsoring employer, what trustees can do about members' Brexit worries and how he believes the pensions landscape will look post-Brexit. Why become a fellow of the PMI? Robert Branagh, Past President of the PMI, discusses the key characteristics of professionalism, and how it is developed, the current state of professionalism in the UK, what millennials bring to the mix and what PMI can do to help going forwards. Tom Cowley, Associate at Barnett Waddingham, discusses why pensions administrations have recently been brought to focus, how trustees can engage with pensions administration providers, and exercises that can be done to improve the pensions admin service. DB pension failures have been making headlines recently casting into the spotlight the support that members receive. Jonathan Watts-Lay, Director, WEALTH at work, discusses DB transfers and the best ways to protect members. Michelle Cracknell, CEO at TPAS, discusses what's currently on offer for pensions communication, what developments and implementations there may be for technology in this sector, minimizing data protection and cyber security risk, and explains the do's and don'ts of scams. Jonathan Watts-Lay, Director, WEALTH at work, discusses the background behind recommendations to offer default decumulation pathways, what impact this could have on individuals and what the alternative could be. Pretty Sagoo, Head of Pricing and Execution in Legal & General’s Pension Risk Transfer business, discusses how investments affect buy-in and buyout pricing and what that means for trustees looking to de-risk schemes. View the highlights from our 2017 lecture with Baroness Susan Greenfield CBE here. A channel for pensions professionals, offering industry insight and lifelong learning to our members and the wider industry. The PMI is the largest professional body for pensions professionals in the UK. Title: Are pension schemes still stumbling in the dark with poor data?